WHO I FISHED WITH: This past Tuesday morning I fished with Corey Farrar of Round Rock, TX. Corey, an employee at Dell, is originally from Brownsfield, TX, near Lubbock, where he grew up on a cotton farm and raised show pigs with FFA. He used to fish as a kid, got away from it in his college years at UT-Tyler, and now has taken an renewed interest in the sport. He has his own boat and regularly fishes on Walter E. Long and on Lake Travis. Corey’s goal was to learn a bit about sonar, to get some practical experience in vertical jigging for white bass, and to take a multi-species approach to today’s trip. All of these were accomplished by the time we left the water. Corey Farrar with a 5.00 pound hybrid — one of two larger fish taken from a school which also gave up twenty-one 18.5-19.5″ hybrid on live and dead shad this morning in the first 2 hours of daylight. WHAT WE FISHED FOR: During this trip, we focused on fishing for hybrid striped bass using live shad through 9:15, then switched over to searching for white bass able to be vertically jigged for. We put 30 fish in the boat on bait as we gunned for hybrid, including 23 keeper hybrid, as well as a few shorts and a few white bass. We later found one large school of bottom-oriented white bass in 38′ and put another 20 fish in the boat, including 18 whites and 2 drum, using slabs with Hazy Eye Stinger hooks affixed to the line tie. HOW WE FISHED: This week’s big fishing turn around, thanks to the first really “fishy” weather we’ve had in a long time, continued this morning. Some nice low pressure, grey clouds, and southerly winds dominated the weather again today (second day in a row) and is forecast to hang around all week. The fish have responded positively and once again were feeding well and posturing up off bottom where they could be easily seen on sonar. We fished live shad beginning around 7:15am through 9:15am and could realistically only keep one or two rods baited. 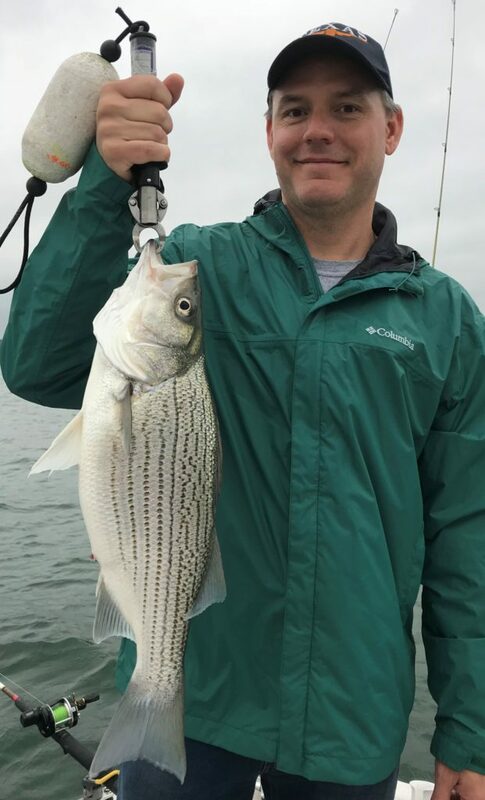 The hybrid striped bass were thick in the lower 4 feet of the water column and just kept biting regardless of what we fed them — be it a nearly 6″ threadfin shad, a dainty 2.5″ threadfin shad, or a piece of cutbait. All but two of the 23 keeper hybrid we caught were “cookie cutter” fish, right at 18.5 to 19.5 inches. The other two went right at 5 pounds. OBSERVATIONS/NOTES: 1) The grey clouds, balmy overnight temperatures, and southerly winds really activated the fish today for a second day in a row. 2) The 69.1F water was the season’s warmest thus far. 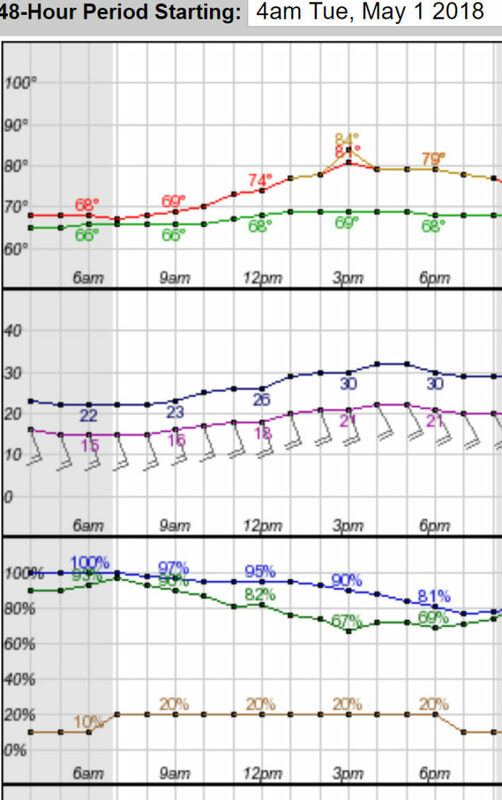 Wind Speed & Direction: SSE11-12 through 10:30, then shifting and strengthening S14-15 thereafter. Sky Conditions: 100% grey with some murk.